With its bright, fresh scent and pale color, lemon juice is often added to meals, juices and even plain water to add a bit of zest and liveliness to the palate. While lemon juice has a range of health benefits, it is also associated with some mild to moderate side effects that may cause you to limit your consumption. 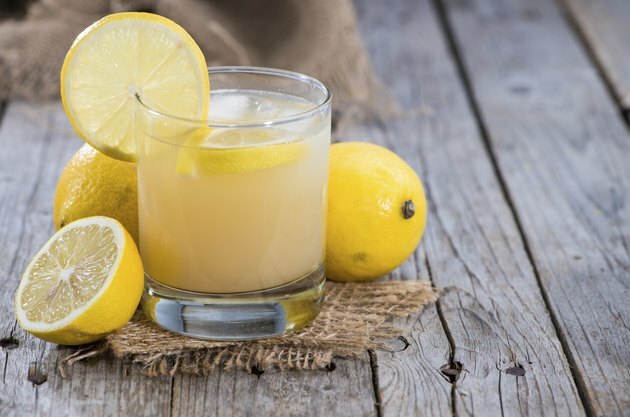 Mixing lemon juice with other foods or liquids tones down the sharp, sour taste and reduces the impact of the high acid content on your digestive system. A 1-ounce serving of raw lemon juice has almost 12 milligrams of vitamin C. This is 13 percent of the recommended daily intake for adult men, almost 16 percent of the RDI for adult women, almost 14 percent of the RDI for pregnant women and almost 10 percent of the RDI for breast-feeding women. Vitamin C gives a boost to your immune system while also helping produce collagen, which is needed to keep your skin, tendons, cartilage, ligaments and blood vessels healthy. Lemon juice may help protect against calcium oxalate urolithiasis, or kidney stones, according to a study published in 2007 in "BMC Urology." Conducted on rats, the study found that drinking lemon juice prevented kidney calcium levels from rising. The lemon juice was effective even when diluted to a 75 percent concentration. GERD is also known as gastroesphageal reflux disorder, symptoms of which are heartburn, nausea and vomiting. GERD symptoms are triggered by fatty, spicy or acidic foods, of which lemon juice is one. If you have ulcers, the increased acid content may also irritate the stomach lining and stop the ulcer from healing properly. Because of its high citric acid content, lemon juice can cause tooth enamel to decay. In a study published in 1996 in "Caries Research," canned lemon juice was found to cause erosion in tooth enamel. This led to stained teeth, a loss of dental tissue and, in some cases, cavities. To reduce the risk of enamel decay from lemon juice, do not drink the juice straight on its own; mix it with other foods and liquids. Proper and regular dental care will keep the acid from wearing away at your teeth.